Row numbering in account schedules can make you a little crazy until you understand what you need to do to get it right the first time. 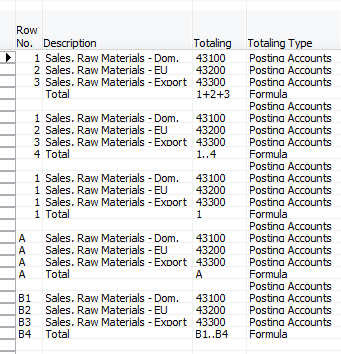 In the example below, I show the design view for five different ways to number the rows for the same account schedule. Some of these work, and some of them don’t, and you might be surprised which one you should choose. Let’s look at the results and talk about why we have what we have. The first and second examples give us the same incorrect result. The third example gives a different incorrect result, and the last two give the same correct result. What is happening? In the first and second example, the formulas are 1+2+3 and 1..4. In these cases, NAV is picking up any row that has the value of 1, 2 and 3 and adding them all together. The total, highlighted in green, is the sum of all the rows highlighted in yellow. In the third example, the formula asks for the result of any row labeled 1. 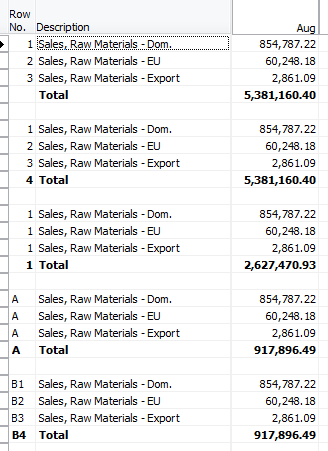 NAV shows the same behaviour by picking up any row that has a value of 1 and adding them all together. 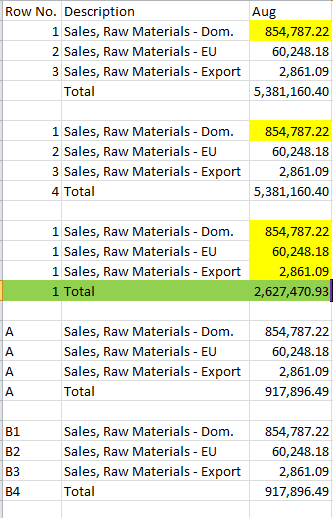 The total, highlighted in green, is the sum of all the rows highlighted in yellow. The fifth section, using an alpha numeric code, is considered a best practice because it allows you the largest amount of variety when designing a larger sized account schedule and helps you to avoid the types of problems seen above by giving NAV something a little more complex to work with than single numbers or letters. You can come up with pretty complex account schedules using alpha numeric codes without having to keep track of which numbers may or may not repeat, and you can keep your formulas short and simple, which makes them easier to type and less error prone. 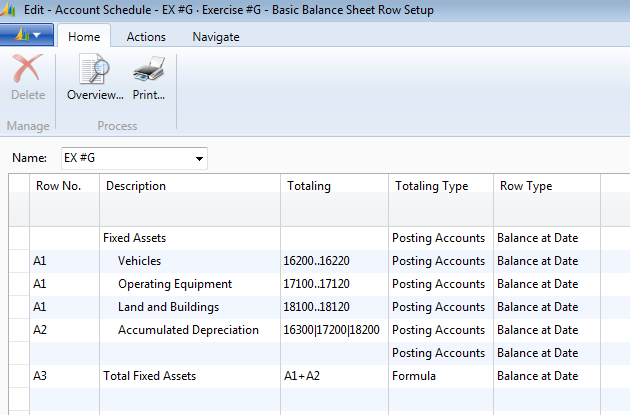 Many companies employ this technique in their balance sheet designs, and use alpha numeric codes to subgroup things like current assets and long-term assets, and then group them at a higher level again for total assets. 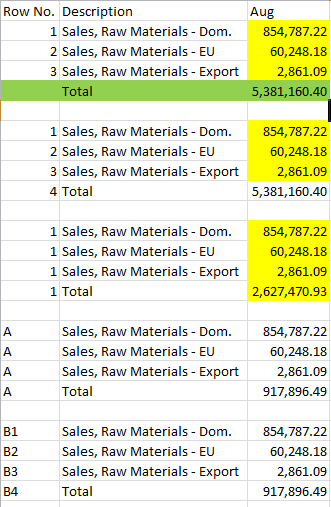 Below is another simple example to show you what a small section of the balance sheet might look like using this technique, this time for fixed assets.